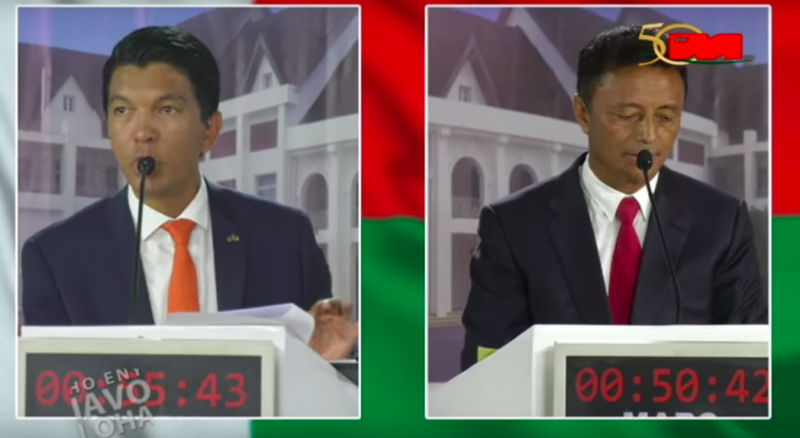 Screenshot of a presidential debate on television between candidates Marc Ravalomanana (right) and Andry Rajoelina (left) via the TVM Youtube channel. Madagascar’s 2018 presidential elections may turn out to be one of the most expensive  per inhabitant in its history. Critics point out that the colossal amount of money spent by various electoral candidates’ campaigns contradicts the small island nation's huge issue with extreme poverty  caused by political and climate instability. On November 7, 2018, the first round of elections revealed two leading candidates, Andry Rajoelina and Marc Ravalomanana, who benefit hugely as independently wealthy people, compared to the other candidates. Ravalomanana was at the helm of a dairy company before going into politics while Rajoelina was an event organizer and worked in advertising prior to his first electoral campaign. They also both benefited from the backing of national and foreign investors during their current presidential campaigns. After the first round , Rajoelina and Ravalomanana each won 39.19 percent (1,949,851) and 35.29 percent (1,755,855) of the votes, respectively. They will now contend for the presidency in a second round scheduled for December 19, 2018. Meanwhile, Malagasy people are poorer than ever. According to the World Bank , nearly 80 percent of the population lives on less than $2 USD per day and half the children under 5 suffer from stunting. Only 13 percent of Malagasy have access to electricity, one of the lowest rates in the world. Much of the infrastructure, including roads, hospitals, clinics and schools are in total disrepair. To prevent under-the-table financing and campaign finance influence on the 2018 presidential elections results, the nongovernmental organization Transparency International asked candidates  to share their financial sources publicly as well as their pre-campaign and campaign budget. Many candidates have complained  about the difficulty of competing with the lead candidates, because of the financial cap set for electoral expenditures. A 2017 European Parliament resolution declared that “a big illegal and inexplicable stock of rosewood was found in the presidential palace  at the end of Rajoelina's mandate in 2013,” suggesting massive corruption at the highest levels. Le problème qu’on a actuellement, c’est qu’on peut supposer qu’une partie de ces dépenses-là [NDLA: dépenses de campagne] sont financées par de l’argent qui n’est pas légal, par de l’argent sale et bien-sûr, on ne peut pas s’attendre à une politique propre qui est financée par de l’argent pourri. The current issue is that, you can think some of these [campaign] expenditures are financed by illegal money, with dirty money, and of course, you cannot expect clean politics which have been financed by corrupt money. It is not the money which should govern, it should be ideas. Unfortunately, with the multiple goodies distributions, we have seen since five days of electoral campaign that the methods have not changed. If we wait until the campaign is finished to reveal frauds, embezzlement, it will be too late for the voter. Despite the high stakes of the upcoming election, corruption in Madagascar has turned Malagasy citizens off to engagement with the election process. Two-thirds of Malagasies are under the age of 25, but youth have shown very little interest so far. Madagascar is now ranked 155 of 175 countries evaluated by Corruption Watch. A lack of government control since its 2009 military coup  has led to plundering all of the natural resources, which has caused damage to Madagascar's fragile coastal ecosystem. Former leaders have a set a precedent for extreme spending in politics: During the 2013 presidential elections, then-elected President Hery Rajaonarimampianina spent 43 million dollars  — the equivalent of 21.3 dollars per voter — double the amount spent by US President Donald Trump in 2016  — during the US presidential campaign. This is by far the most amount of money spent per person in one of the poorest countries  in the world. Many Malagasy have noticed that extreme spending during presidential campaigns could be better spent addressing extreme poverty.